Hen Harrier day in the Peak District – where shall we go? Interest is certainly growing in Hen Harrier Day – 10 August 2014. This event, to protest (peacefully and legally) against the illegal killing of Hen Harriers will take place in Lancashire (though I don’t know much about that), Northumberland, Durham, Yorkshire and Derbyshire. I have the challenge of organising the Derbyshire event. I have quite a few helpers already and I’m grateful to those who have got in touch. These events have sparked interest from the Wildlife Trusts, the RSPB and many others since being announced. The Derbyshire Peak District has not been the friendliest part of the world to birds of prey – see here, here and elsewhere. It is said, can anyone confirm this please, that there are more Peregrine Falcons nesting in Central London than in the Peak District National Park? And so, we are looking for a location where at least two people (including me), more probably scores of people, but quite possibly hundreds of people, might gather on 10 August simply to record their opposition to the illegal killing of Hen Harriers. Any offers, please? How about the National Trust? What about the members of the Moorland Association? Can the Peak District National Park help? Would the CLA like to offer a helping hand? Perhaps the Game and Wildlife Conservation Trust would like to be involved in organising such an event? Please, don’t be shy in coming forward. We are all implacably opposed to the illegal killing of Hen Harriers aren’t we? 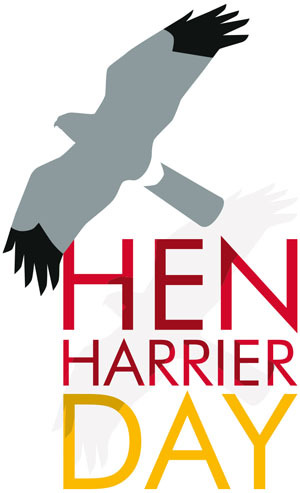 The Hen Harrier Day logo was designed by Anthony Roberts and is gorgeous. Each Monday evening at 6pm this blog will post updates on the progress of Hen Harrier Day. It would make an ideal spot - idyllic location, plenty of parking nearby, lots of hen harrier prey and habitat, yet unfortunately no breeding hen harriers. As he appears in the above article to be such a big fan of all wildlife Im sure he would be only happy to help. As a man of all wildlife, you could also ask him if he has any theories why the Derwent Valley isn't full of successful breeding Goshawks any longer? Gongfarmer - maybe he'll come forward? I doubt it, I think you will struggle to find any sporting manager in the Peak District who will volunteer. I'm guessing you may have to openly ask/shame one into it - I'd definitely start with Geoff as he's always keen to promote the positive (?) benefits of grouse management above all other moorland managers. If he says no ask why then ask his landlord - NT. Duke of Devonshire, Chatsworth Estate, that's where you need to be. Perhaps hen harriers and goshawks. Hen Harrier Day is a great idea, and I for one will do my utmost to be free to march up onto the Derbyshire moors with you on Sunday 10th to demonstrate concern over raptor persecution. I am deeply concerned that the peregrines we encourage to breed at Derby Cathedral could well end up in a gamekeepers trap or be otherwise 'got rid of' if they dared to venture up onto one of northern Derbyshire shooting estates. One worry though - there's a Page on Facebook promoting Hen Harrier Day on August 12th (by Birders against Wildlife Crime). It would be a shame to weaken the concept by having conflicting dates. I've just put the date in my diary - see you in the Derbyshire Peak District on 10th August. Don't forget the South Yorkshire Peak here too, all the East side of Upper Derwentdale is in S.Yorks, including Howden Moor. Goshawks have been decimated on the Langsett-Strines moorland fringes, with any Harriers not having a hope in hell in these areas. Andy - thanks. It is clearly bandit country. The landowners, or maybe tenants, must be mad about all that illegal activity.